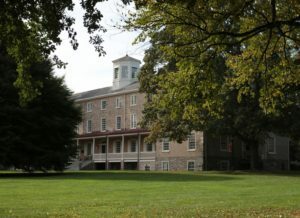 Are Haverford Students Drinking Less? Over the past few years, transportations at Haverford have been on a slight downward trend. Transportations, where students are taken in an ambulance to the emergency room due to either consuming too much alcohol or drugs, are distinct from hospitalizations, which means that a student has been admitted into the hospital. As students may remember from the frequently-cited statistic during Customs, no Haverford student has been hospitalized for eight years. However, students are transported fairly frequently. 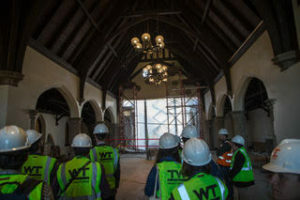 “Basically the way it works is every Friday and Saturday we have a on-call EMT down by the apartments,” said Brian Murray, head of Haverford’s day-to-day security operations. “We get a call from a student saying ‘we think a student has had too much to drink’ so then we go over. If [the EMT] feels the student is in such a condition where they need to go to the hospital, we call the ambulance.” Around 60% of Campus Safety calls relating to alcohol will wind up with transportations. 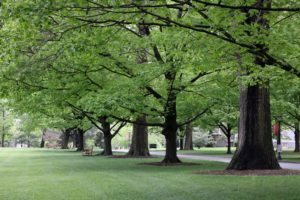 “’Lately there has been a subtle reduction in the calls here at Haverford. This would normally have us a bit nervous,” Tom King, Executive Director of BiCo Campus Safety said. King said that he believes that if calls go down, it is typically not a sign that students are drinking less—it just means there is less trust in campus safety. For instance, a few years ago, Campus Safety calls dramatically dropped at Bryn Mawr. But, with some investigation, King discovered that the reason was a rumor that Campus Safety would call for transportation in all instances. This year, he said, “students are drinking less,” which he attributed to a number of factors. 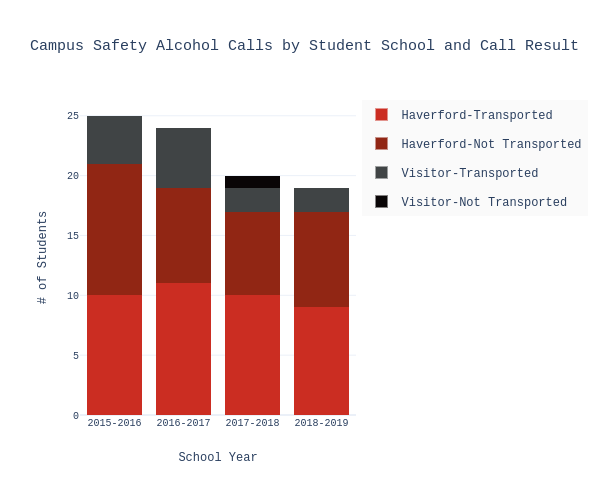 The overall number of calls to Haverford’s campus safety has declined over the past school years. Data obtained from Haverford Campus Safety. King added that he believes that Haverford’s approach to tackling campus drinking is the safest. “We do a lot of reading of after action reports at places that have so called “zero tolerance.” [At these schools] people, when they go to the hospital, they won’t wake up the next day: people die. It happens disturbingly frequently and in almost every case there were one or more students that could have called for help but didn’t because they didn’t want to get in trouble, or didn’t want to get the person drinking in trouble,” he said. However, King wants to stress that Haverford’s alcohol policy is not “open,” and if you overdrink, there are consequences. When King first started at Haverford, he created a memorandum with the local police that no one would get cited for alcohol. 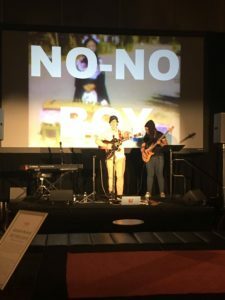 Yet, the college quickly realizing that approach was not working: students started going to the hospital with a high degree of frequency and were getting hospitalized—all while openly advertising to their friends that you could drink as much as you wanted at Haverford without getting in trouble. After meeting with deans and the police department, it was decided to put an end to the memorandum. Today, if students are transported they will likely (but not in all cases) receive a non-traffic summary citation. The citation will not be on any permanent records or entail a big fine. It typically consists of doing community service. Furthermore, whether or not a student is transported, in the case of a campus safety call they will meet with their dean and Joye Shrager. “I was really worried going into meet with Joye, obviously it’s a sensitive topic and I was worried she would jump right into it. But she got to know me and provided helpful suggestions. She’s really knowledgeable,” says one anonymous student who was sent to meet with Shrager after a transportation. Shranger echoed that her job mostly involved education on these issues. Right now, Haverford’s alcohol policy appears to work. The recidivism rate of students transported is very low, and the decreasing trend looks promising. But, its success is the result of hard work. “We pay very close attention to trends and it is a very difficult balance: the trust in students and student self governance along with the law and consequences. It seems to be working, but we don’t take it for granted. We are constantly working on it. [Right now] we are working on a student EMS program to help make calls on transportations,” King said.